Which isn’t to say there are not a lot of great things going on within the confines of our gated retirement community – because there are plenty. Hyde Park is a resort-style community designed for adults 55 and over who want to stay active, have fun, and intermingle with their neighbors. Our 50-acre, 398-lot property has long been the retirement community of choice for people who put a premium on relaxation, recreation, and just generally using retirement as a time to broaden one’s horizons. 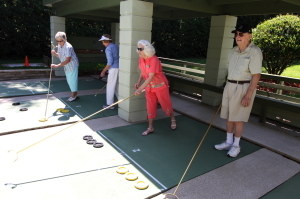 At our 55+ retirement community near Orlando, there is almost never a shortage of stimulating organized activities to engage in. Popular activities include dominoes, bingo, quilting, arts and crafts, Bible study, group aerobics classes, lunch and learn seminars, potluck dinner, shuffleboard, billiards, chair exercises, and much more. If you plan to be in the Orlando, FL, area and would like to experience first-hand what life is like at our retirement community, please contact our Lifestyle Team today.